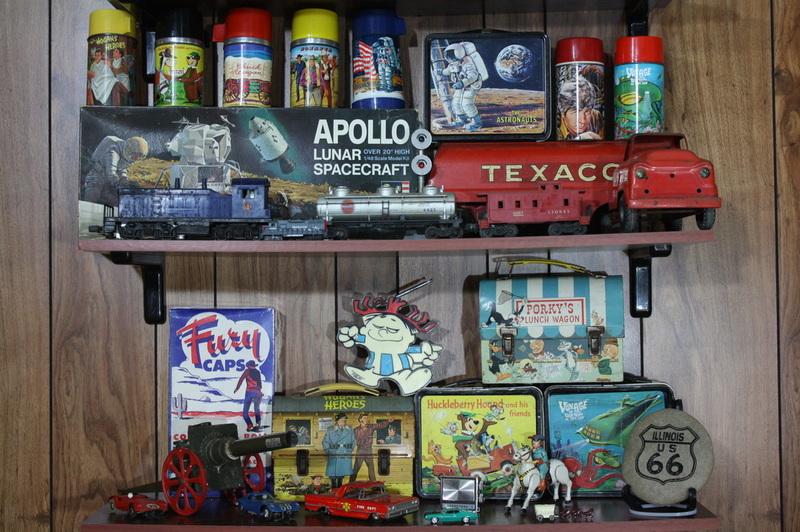 This page contains different toys owned or collected over the years. Anything related to toys or other collectibles may be listed. Check back for new additions. Thanks for looking. This is an old Hawaiian Punch radio nicely shaped in the image of their longtime spokesman "Punchy". It's in nice shape with good color but has some yellowing from age. Antennae fully extends however the battery cover is missing. Hooked up a 9V battery and only received static. Nice old TV advertising collectible. Item Only Ships in the U.S. Above are 2 old sale packs of Sylvania Blue Dot flashcubes. Each pack holds 3 individual flashcubes. Packages are complete but show some fading and bending. Items Only Ship in the U.S. Here's a complete set of Odder Odd Rod sticker and trading cards. All 66 cards are in excellent condition with square corners. Here is a Beatles metal serving tray made the Metal Tray Manfacturing Co. in England. This was produced in the late 60's when the Beatles were a hot item. Excellent graphics with very few scratches. Measures about 13" X 13". Here's a toy Coke Dispenser with 3 plastic glasses and its original box. This was made by the Trim Molded Products Corp. and is in excellent overall condition. The main unit has good paint retention and nice graphics but the Coke sticker is peeling slightly. The 3 glasses are in good condition (one is missing). The box is in nice shape but has torn plastic on the front and one end tab is missing. Nice vintage item. This is an AMT 1968 Star Trek USS Enterprise space ship model kit in its original box. Original parts are still sealed in plastic bag. Also, included are building instructions, decals and special offer pamphlet. Box has vivid colors and lettering but top has one split corner. Here are four sets of original plastic Ford Cobra snake fender emblems. These were made for cars from 1979 - 2004. All four colors - Chrome, Red, Blue, and White - are in excellent condition with original mounting tape on back. Pictured above are various Ford Cobra emblems and plaques. A short description and prices listed below. Shipping/Handling included in price. Pictured is a near mint Rat Patrol metal thermos - produced by Aladdin in 1967 for the World War II TV show based in North Africa. Thermos has a glossy finish with no dents, dings or rust. Cap and stopper are very nice and the bottom has a mirror finish. ﻿Here is a Beverly Hillbillies metal thermos in excellent plus condition made by Aladdin. It was produced in association with Filmways TV Productions Inc. in 1966 to accompany the high rated TV show. It has excellent paint and graphics, no dents or dings and a shiny bottom. This is a Get Smart metal thermos in near mint condition. It was made by Talent Associates in 1966 for the very popular TV show starring Don Adams. Thermos is in wonderful condition with no dents or dings, graphics are glossy and vivid with a shiny metal bottom. Shown is a Zorro lunchbox and metal thermos. The set was made by Aladdin in 1958 to highlight the popular TV show. Both items are in excellent plus condition. The lunchbox has great paint with very few scratches - old label removed is still visible on one side. Handle and hardware are in great shape and the inside shows minimal wear. Metal thermos has glossy finish with the original label on cap. Small dent (can only be felt) by seam. Mirror finish on bottom. Nice complete set. Here is a near mint Welcome Back Kotter metal lunchbox and plastic thermos. This set was made by Aladdin in 1977 for the running TV show and includes the hang tag. The metal lunchbox has vivid colors with very minimal scuffs or scratches - mostly noticed along outer edges. Inside looks brand new with only tiny wear spots from opening and closing the box and includes the bail. Thermos is near mint with great colors. ​Items Only Ship in the U.S.
Pictured is a Star Trek domed lunchbox and metal thermos in excellent condition. This set was made by Aladdin in 1968 to showcase the hit space TV show. Lunchbox is in great condition with vivid colors and only minor scuffs and scratches noticed on outer edges. Bottom scene of bridge on Enterprise shows paint loss mostly on feet. Handle and metal hardware in great shape. Interior very nice with few wear spots. The original metal thermos has great colors, no dents or dings. Metal rims, seam and bottom show slight aging. HTF original set. offers, purchases or general comments. Form available on "Contact Info" page.